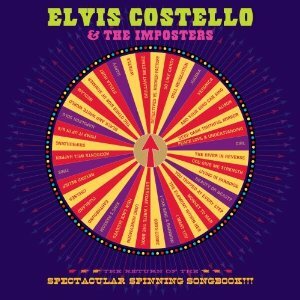 We are excited to confirm the component releases of last year’s ”ELVIS COSTELLO - THE RETURN OF THE SPECTACULAR SPINNING SONGBOOK!!!" in three formats (standalone CD / standalone DVD / Deluxe CD + DVD) for March 12th 2012 internationally. Please find details below. This Deluxe Edition of The Return Of The Spectacular Spinning Songbook!!! includes a CD, DVD and 28 page booklet filled with musings from Napoleon Dynamite (aka Elvis Costello), the MC of The Spectacular Spinning Songbook show. Recorded over a 2-night stand at The Wiltern Theater in Los Angeles on May 11 and 12, 2011, the CD was culled from both nights' performances, shows which The Los Angeles Times said were "the kind of uniquely invigorating experience that warrants a buzzword all its own: inspiring." and includes popular songs such as Everyday I Write The Book, God Give Me Strength, Watching The Detectives, (What's So Funny `bout) Peace, Love and Understanding plus a cover of the Rolling Stones' Out Of Time; an extended I Want You; and the return of the Bangles on Tear Off Your Own Head. The DVD is from Costello's show on May 12, 2011 and includes a special guest appearance by the Bangles. The DVD contains bonus footage including an alternate intro by Napoleon Dynamite (aka Elvis Costello), and behind-the-scenes moments captured with the Imposters--Steve Nieve, Davey Faragher and Pete Thomas--as well as extra performances not included in the main set of the show. This 19 track DVD is from Costello s show on May 12, 2011 which included a special guest appearance by the Bangles. The DVD contains bonus footage including an alternate intro by Napoleon Dynamite (aka Elvis Costello), and behind-the-scenes moments captured with the Imposters as well as extra performances not included in the main set of the show. The Spectacular Spinning Songbook is also available as a CD and a Deluxe Edition CD/DVD. This 16 track album includes popular songs such as Everyday I Write The Book, God Give Me Strength, Watching The Detectives, (What's So Funny `bout) Peace, Love and Understanding plus a cover of the Rolling Stones' Out Of Time; an extended I Want You; and the return of the Bangles on Tear Off Your Own Head.